West Ham showed no fight as they produced "the worst performance of the year" in a 2-0 loss to Everton, said Manuel Pellegrini. Kurt Zouma gave Everton the lead inside five minutes at London Stadium and Lukasz Fabianski had to keep Dominic Calvert-Lewin, Gylfi Sigurdsson and Lucas Digne at bay before quarter of an hour had been played at London Stadium. West Ham continued to be cut open at will by their expansive visitors and Bernard got a deserved second for Everton before half-time. Pellegrini responded by changing from a 4-4-2 to a 4-2-3-1 but the Hammers failed to register a single shot in the second half – their tally of three efforts on goal was their lowest in a home Premier League game since 2005-06. "Very disappointing because without a doubt it was the worst performance of the year," he told BT Sport. "You can win or you can lose but not in the way we did, without fighting and without creating chances on the opposition's goal. "It was another option to move seventh. Everton were two points behind us. Watford lost before we started and it was an opportunity to demonstrate we could be in another position in table. It's not the first time it's happened. We found it impossible to make two passes in a row." Issa Diop failed to challenge Zouma to Sigurdsson's corner on the opening goal and Pellegrini was far from impressed with West Ham's defending at set-pieces. He added: "We are conceding too many goals from set-pieces. That was an easy goal. It was just because we didn't jump for the ball. "But you can concede a goal in the fifth minute and you can change the game after that, or at least create chances and show another face. All the players had bad days." 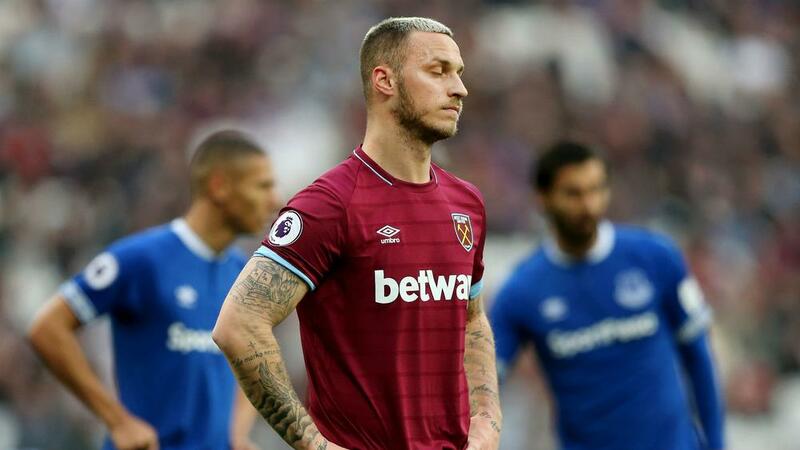 Marko Arnautovic was moved out to the left wing for the second half and had ice on his knee in the dugout after being replaced by Grady Diangana in the 67th minute, and Pellegrini confessed playing the striker was somewhat of a gamble. "Marko's been playing a lot of games with pain in his knee. In the international games he played with Austria he felt it again. He was maybe not 100 per cent," said the manager. While Pellegrini was clearly unhappy with his side's showing, Marco Silva hailed Everton's improved defensive resilience. "Very satisfied. Very proud of what we did here," he told reporters. "It is everything we are working to achieve. "The last five games we have four clean sheets. I was really happy what we did this afternoon. From the first minute we were the best team on the pitch. "Two-nil at half-time was a really good result for our opponent because we had chances to score three, four and five. "It was one of the most consistent performances of the season."